Thank you for visiting the Larkspur Historical Society Website. The society was incorporated in 1990 and our areas of interest span: Southern Douglas County, Colorado and Divide Country, including the areas of Larkspur, Greenland, Perry Park, Spring Valley, and Cherry. Currently, we have 16 site survey books; our hope is to give you insight into our area with stories and pictures of Southern Douglas County and Divide Country. Larkspur, Greenland and Spring Valley are very unique and historical areas of Southern Douglas County and Divide Country. 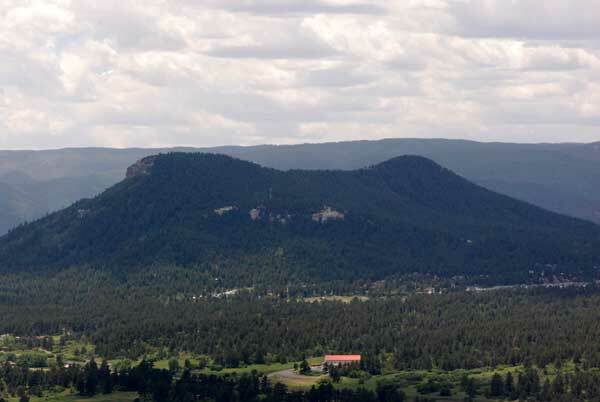 The Town of Larkspur is located 14 miles south of Castle Rock along the I-25 corridor with Greenland another 4 miles south near the Douglas/El Paso County Line. All three areas played an important part in the early development of Colorado and Douglas County. Larkspur actually became an outgrowth of Huntsville, one of the oldest settlements of Douglas County and the Colorado Territory. Huntsville, so named for Colorado’s territorial governor Alexander Hunt, began as a stage stop for early travelers and freighters along the East Plum Creek wagon road traveling South to Colorado City known today as Colorado Springs. In 1860 Huntsville became Douglas County’s first territorial post office. This post office was important because of the location mid way between Denver City and Colorado City. In 1864, it became necessary to build a fort for protection from Indians. Fort Lincoln, sometimes dubbed Oakes Folly, offered safety to early settlers in and around Huntsville. In 1862,D.C. Oakes established a sawmill. Along with the Coberly Hotel, the small settlement grew to eventually include mining in the nearby clay pits and agricultural endeavors. When the railroad came to Larkspur in 1871, the post office was moved from Huntsville to Larkspur, and the stage lines ceased operation making Huntsville a ghost town by the early 1890’s. Larkspur history is rich in both natural resources and important people who played a part in its early development. Named by Elizabeth Hunt for the blue flower that grows abundantly in the area, Larkspur played a key role for the railroads by supplying water and fuel. Many important explorers of the 19th century passed through the area. Kit Carson and Jim Baker, well known mountain men, were frequent trappers in the area. In 1820, the Stephen Long expedition described Raspberry Mountain and many of the wildflowers never before cataloged. Early Larkspur was a major lumbering site for railroad ties, telegraph poles, and firewood with millions of board feet harvested from the area. With the railroads providing a shipping point, mining was also a large industry with gypsum, red sandstone, and potash. With two sawmills, a blacksmith shop, hotel, two general stores, a post office, school, and even a casino, the population soared at the turn of the century. Although ranching was the mainstay of the area, Larkspur and Perry Park were touted as a health resorts. People from both Colorado Springs and Denver would come by rail to enjoy the fresh air. A stage line would take people to Perry Park with trumpeters and dancers waiting to great the coach. Being a party town, Larkspur boasted one of the largest moonshine raids in Douglas County with 225 gallons confiscated in 1931. One Larkspur business that brought prosperity to the town was the Carlson Frink Creamery, most noted for its Black Canyon Cheese. The creamery provided income for the many dairymen in surrounding towns. The creamery, along with most of old Larkspur, was destroyed in the 1965 flood of Plum Creek. The American Federation of Human Rights was incorporated in 1912 with its headquarters located just West of Town. Remaining virtually unchanged, the Federation just recently became listed on the National Register of Historic Places. Today, Larkspur is synonymous with the Renaissance Festival. For six weekends every summer, the town swells with thousands of families out for a day of fun. The festival provides about 70 % of the town’s income making water and sewer services possible for the town’s infrastructure. Larkspur is facing many challenges. Being a bedroom community of both Denver and Colorado Springs, growth over the last decade has doubled, forever changing the visual landscape that makes Douglas County so unique, open, and beautiful. However, just recently the owners of the J.A. Hunt Ranch, homesteaded by Territorial Governor Alexander Hunt in 1859, agreed to sell a conservation easement to Douglas County that will virtually prohibit all development on the property. The ranch will continue to be a working cattle ranch as it has for the last 140 years. This purchase, along with the Maytag property to the North, will make it possible for Douglas County residents to appreciate the tremendous beauty of the area much as it was over 100 years ago. The Town of Greenland was platted as a 20 acre town site in 1875 by Fred Soloman, being one of the first platted subdivisions in Douglas County. Greenland, like Larkspur, was primarily a railroad town being one of the largest livestock shipping points in Colorado. Large quantities of lumber, grain, potatoes, milk, and building stones were also shipped out of Greenland. No one would think of this area with an altitude of 7,000 feet as one of the greatest potato producing areas in Colorado but as many as 400 railroad cars of this crop were produced in a season at Greenland. At one time the small town had three stores, a blacksmith shop, saloon, school, and hotel. In 1997, Douglas County purchased all of the vacant lots in the Greenland Town site with hopes of providing an opportunity for historic and cultural education while using the grounds as a repository for historic structures at some time in the future. The Allis Ranch, also located in Greenland, now has a conservation easement which will keep Greenland from changing as we know it today. Located within the town limits is the famous Greenland Ranch which today is the longest continuously operating cattle ranch in Colorado with founder I.J. Noe’s brand being the oldest in Colorado. Mr. Noe was well known for his shorthorn cattle and prize show horses. The big red barn can readily be seen from I-25 and is certainly a local landmark. Thankfully, the 21,000 acre ranch has stayed in tact with owner Edward Gaylord. Greenland Ranch is one of the largest undeveloped tracts between Denver and Colorado Springs and virtually unchanged since the settlers first came here. Currently, the ranch is involved in the I-25 Conservation Corridor Project with the idea of preserving the scenic views of Pikes Peak along with limiting development. Spring Valley, located about 20 miles South of Franktown and 1 mile West of Highway 83 on Lorraine Road, was most notably known as a stage stop on the West Cherry Stage Road as early Douglas County was carved out of the Colorado Territory. The settlement contained the Geiger Store, a cheese factory, livery stable, cemetery, and school. Spring Valley School, being the third school district in Douglas County, still stands today at the intersection of Spring Valley Road and Lorraine Road and has been completely restored along with all outbuildings on the premises. The Spring Valley Cemetery ½ mile North of the school contains the graves of Douglas County’s earliest settlers and their families. One can easily see the difficulties of early life on the frontier by looking at the ages on the head stones. One of the hardest things to visualize is families losing five or six children in one year. A complete set of photos resides in the Local History Collection at the Philip S. Miller Library.